GODHRA (Gujarat): Religious guru Asaram Bapu and four others had a miraculous escape when their helicopter crashed just ahead of landing at a local college here today, police said. They sustained minor injuries in the incident, police said. 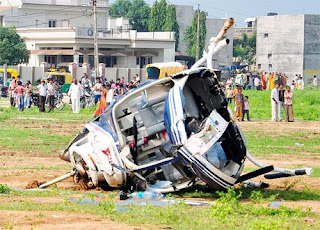 "The chartered helicopter Asaram Bapu and his followers were travelling in developed a technical snag prior to landing at Godhra Science college and fell from a considerable height," police officials said. It fell on the ground after losing balance and the impact was so powerful that it lay tilted on the ground, they said. Bapu and the pilot had to be taken out after breaking the glass. They were rushed for treatment to a nearby Ashram hospital, officials said. The guru was scheduled to address a two-day satsang (religious) function organised here, they said. Melbourne: A contractor of Australia's supermarket chain Coles has come under fire for publishing a job advertisement, which barred Indians or Asians from applying. "Store requires no Indians or Asians please. Must speak English (sic)", read the online ad posted on Sunday. It triggered outraged on social media sites, with people calling for a boycott of the store. Local newspaper The Mercury reported that the ad was later removed from the site. A Coles spokesman on Monday admitted the ad had been posted by a contract company responsible for cleaning its Rosny store. "The ad was placed without Coles' knowledge and we were extremely concerned to learn of the ad and its contents," spokesman Jim Cooper said. With Air India’s first Boeing 787 Dreamliner landing here on Wednesday, a delivery schedule for the aircraft would be firmed up soon as two more are ready for delivery, official sources said.The last hurdle in taking delivery of this plane has been cleared with the law and justice ministry giving nod to the compensation settlement agreement which Air India would sign with the US plane-maker for the four-year delay in its deliveries. An Air India team has reached Boeing's South Carolina facility to go through the formalities as soon as they get a nod from the airline's brass.A definitive delivery schedule would follow soon and it could involve the first few of these long-haul planes being delivered in 7-10 day intervals, the sources suggested. The revolution is spearheaded by workers who are investing their own resources to buy, learn, and use a broad range of popular consumer technologies and application tools to get things done in the workplace. These consumer technologies and tools are bringing down the old artificial barriers around the workplace. At work and at home and everywhere in between, tech-savvy workers and consumers are using the same powerful, widely available tools and applications – from smartphones and iPads to social networks and instant messaging - to stay informed, connected and productive in their professional as well as their personal lives. Add to that the changing usage demands of an always-on environment with anytime/anywhere access fundamentally changing support and service requirements. Opposition Leader Tony Abbott says the government is "wrong-headed" to link its emissions trading scheme to Europe's carbon market. Climate Change Minister Greg Combet on Tuesday announced the Australian scheme would link with the world's largest carbon market in Europe from 2015 and the government would not go ahead with a floor price for carbon emissions. Asked what signal it would send to the rest of the world about Australia's commitment to tackling climate change, Mr Abbott told reporters in Townsville: "Europe is not the rest of the world . our competitors, our trading partners, are not introducing a carbon tax". "And this idea we somehow secure our economic future by tying up with Europe, when Europe is going backwards and Asia is going forwards, just shows how wrong-headed this government is," he said. MUMBAI: In a surprising move, joint director-general of civil aviation A K Sharan, against whom the Central Vigilance Commission and the aviation ministry recommended major penalty proceedings last month and who was under suspension after being found guilty of fraud, has been reinstated with no action taken against him. "With this, the civil aviation ministry seems to have sent out a message that the misuse of power and use of fraudulent means to help one's kin acquire a pilot's licence is acceptable in the civil aviation regulatory body," a senior commander told TOI.